I attended Hatfield School from 1958 to 1965 when I was bussed in every day from East Barnet (which was then in Hertfordshire). I have few photographs from that time, but I have all of the annual school magazines from that time (Vol 6 – 12) which contain much of interest. At that time, Hatfield School took pupils from all over Hertfordshire, which meant that at end of the 6th Form we all dispersed to start a new life. So I know nothing about anybody’s subsequent life – not that I want to – I have the 1958 School Photo with the first years and the staff frozen in time. 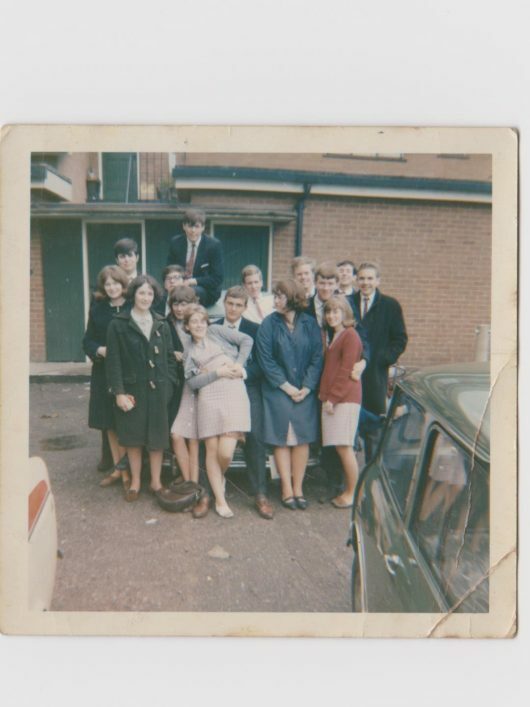 The photo that I’ve enclosed is of my 6th Form friends I think near the end of our time at Hatfield School as it looks suspiciously like the side of The White Hart in the background! This page was added on 21/03/2018. I took O level biology in 1966. I can’t remember the textbook, but the teacher was Murray Mylechreest. I attended Hatfield School from 1964-1971. I took O level Biology from 1966-1969. Does anyone know the name of the textbook we used? What was the name of the teacher?